Who knew that a trip to summer theater camp would lead to a lifelong passion? It did for Greg Marzullo. It is where he was first introduced to yoga. “The sun salutations made me feel focused,” he recalls. “Yet, I also felt expansive mentally.” Throughout his teens and early twenties, Greg practiced asana. Then life got in the way. He spent the following years pursuing a dance and movement theater career. During this time, he helped to found the award-winning Helen Hayes Synetic Theater. 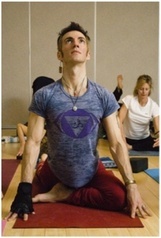 Realizing how much he missed yoga, the balance it brought to his body and the spiritual gateway “to walking a more peaceful, compassionate and loving road”, Greg made a commitment to return to the practice. Upon completing a 200-hour yoga teacher training course at Flow Yoga Center, Greg now views his role as one of deep service to yogis of all backgrounds. Currently, he is studying belly dancing and working on his 500-hour teacher certification with Shiva Rea. He also has taken workshops in ecstatic dance traditions in Northern Africa and Southern Italy.